I am Ian Blore, a member of the East Greenwich Residents Association (EGRA). I have been monitoring air pollution in the locality for over a year as part of a citizen science effort. EGRA was founded in 2013 to, among other things, help promote and improve the social, economic and environmental well-being of residents within the area of East Greenwich. The very poor air quality we have revealed in London can only be made worse by such thoughtless developments. I am helping a local resident to pursue this case in an effort to stop a further increase in pollution from the cruise liners and to convince Greenwich Council that onshore-power and a pollution-free terminal is the only way forward. I hope that you can help too by providing funding for the legal case. The Judge deciding the substantive judicial review of the cruise port planning permission has dismissed the claim that it is unlawful. Those of us who have been campaigning for a clean cruise port, using twenty-first century shore side power and not ships' diesel engines whilst the ships are berthed, will continue to argue for this solution. Greenwich Council has approved plans for a cruise liner terminal on the River Thames that will cause increased air pollution. The simple way forward is to provide clean onshore power to the cruise ships. Help clean up the river, London and other cruise ports. A local resident of East Greenwich has challenged Greenwich Council’s decision of December 2015 in granting permission for an international cruise liner terminal on the Thames. The grounds are that there has been inadequate assessment of the air pollution that will arise from ships and associated development. Local residents have consistently called for clean onshore power supply to be provided to avoid dangerous emissions from ship’s diesel engines in a dense residential neighbourhood. “Hotelling” cruise ships that run their auxiliary engines burn at least 700 litres of diesel an hour; the equivalent of 688 permanently running HGVs. Cruise ships are planned to dock for the six summer months, when pollution in London is at its worst, and dirty diesel emissions will affect large populations on both banks of the river. Ships auxiliary engines run on dirtier diesel than lorries. Also unlike lorries these ships do not treat or filter their emissions. Disquiet about air pollution is widespread and increasing. At a national level Jim Fitzpatrick, MP for Poplar and Limehouse, expressed concern to a Government Select Committee that air pollution from the terminal would affect the whole of London. We also understand that mitigation measures such as onshore power will be obligatory by 2025 and asks what is the use of building a cruise port that may be obsolete in 7 years? Both the Greenwich Society and the East Greenwich Residents Association (EGRA) wholeheartedly support this legal challenge that will hopefully result in a judicial review of the planning decision. Your financial support is vital to help a brave citizen pursue this case against a planning authority. We need a community contribution to support the proceedings. We initially ask for £6,000 to begin the case. A decision is critical to South East and East London, including Greenwich, which is one of the most polluted London boroughs. However, anyone who objects to air pollution should express support to help highlight their concern. Frankly, local residents and communities are getting increasingly fed up with councils and government failing to properly consider the serious environmental impacts of their decisions. A clean cruise port for London that does not pollute our air, and an example for less pollution from new developments. Application for judicial review of the planning decision has been made; we await whether the case may be heard Dr Paul Stookes, Richard Buxton Environmental and Public Law Solicitors acting on behalf of a local resident. "If the Member State grants permission to a project that would increase pollution beyond the limit values for ambient air quality, it would logically have to take compensating measures to ensure compliance with the limit values"
(Italics show Commission’s own words). These opinions may appear anodyne but they may well help with the next steps of securing a clean cruise port with onshore power supply. They underline the need for a national or local approach rather than relying on European action; the European directives provide a framework for action at a national and local level. EGRA is considering its next steps. They will include following up the case made to Michael Gove, Secretary of State for the Environment, last summer. EGRA will seek a meeting and will also continue to discuss riverine air pollution with the Port of London Authority and the Royal Borough. Our local MP, Matt Pennycook, continues to actively promote the case for a clean cruise port. This conclusion brings to an end the specifically legal arguments about air pollution caused by a cruise port in a residential area. The arguments will continue at a political level, as they have for nearly three years. All your help and backing has been invaluable in bringing the case so far. It is not the result we had hoped for but it has shone a powerful light on the operations of the cruise industry and highlighted the need for alternative power sources when ships are berthed. You may continue to follow the story on the EGRA website (www.egra.london). Once more, many, many thanks and a very good New Year to you. We need your support for two new online petitions. This should only take a little of your time and your backing is free. Two petitions for the price of none is a good deal to help prolong a life or protect childrens’ lungs. The first petition is addressed to the new UK Secretary of State for the Environment and can be viewed here. Please open this Change.Org site and follow the instructions to sign the petition. A verification email, follow the instructions and you should get a second email saying you are registered. Open the webpage (as above) again and click Support; it will take you through and you will get a final "success" email. Thank you. There is movement from the Mayor’s Office, the European Parliament and even the Port of London Authority, which we hope to report over the near future. And our voice will be all the stronger if you can share this with friends who agree to support the petitions. We have been informed that our petition to the European Parliament has been deemed "admissible". It is now being investigated by the European Commission and has been also referred to the Committee on Environment, Public Health and Food Safety. We understand that the Committee on Petitions will continue to examine the case once they hear back from the Commission. The process will probably not be swift but has the support of several London MEPs, especially Seb Dance. Action at a European level is needed since the problem affects many ports in Europe, of which only some are installing onshore power supply (in the Baltic, Netherlands and Hamburg for example). EGRA have also raised the matter with Michael Gove, Secretary of State for the Environment and asked if our MP, Matthew Pennycook who continues to be wholly supportive, may do the same. If you do have any time perhaps you may also write to Michael Gove (at Nobel House, 17 Smith Square, London SW1P 3JR). Don't worry if you don't; without your support and the original court case we would not have had a hearing in Europe at all. The government has finally proposed the outline of a long-term vehicle emission strategy to cut air pollution. It is so far limited to road vehicles but we will be arguing that it must apply to new dirty shipping operations in dense residential areas. After all, ships are " a means of conveyance" even if they don't have wheels. Please follow the continuing case which is being argued at London Mayoral level and within the European Parliament. Your continued support is important - and please spread the word. Our petition to the European Parliament has moved on a key stage, to the Commission and Environment Committee for their assessment. This may take two months and is only the start of the process. But we have the support of important London MEPs as well as the local MP for a clean cruise port for the Capital. If you also have time, please watch Dispatches on Channel 4 at 8pm on Monday, 3 July. This will feature the cruise industry and our case. Meanwhile the Mayor of London is still trying to bring all parties together for a resolution, hopefully a greener facility with onshore power supply. Your backing has helped to make this local case into a London, National and European issue. You will soon have the chance to support the European Petition. Watch this space for details. It will be free! The campaign for a clean London cruise port in Greenwich goes on at both local and European levels. East Greenwich Residents Association (EGRA) agree with that position and will be asking other parliamentary candidates to support it. Once the election is over we hope that meetings will continue at Borough and London levels and will include our local MP. EGRA are also pursuing their petition to the European Parliament. We always knew this would be a slow process. But we have the support of MEPs Seb Dance and Claude Moraes who are liaising with a key colleague on the Committee on Petitions (Jude Kirton Darling) to ensure that the petition is heard expeditiously. We will let you know further news as soon as we have it. This fight is but part of a bigger effort to make our air fit to breathe. EGRA continues to engage in this wider debate (see latest). We appreciate Matt Pennycook’s work on air pollution not least in the establishment of the first ever All-Party Parliamentary Group on Air Pollution. Permission has been refused today (22/2/2017) by Lord Justice Henderson for an appeal against the High Court decision of 8 August 2016. He found that Greenwich Council had not made any error in law in granting permission for a turnaround cruise port at Enderby Wharf. That permission would allow a potentially highly polluting cruise liner terminal to be built and operated in the heart of London. Running ships’ diesel engines may burn on average 700 litres of diesel an hour which can be as polluting as 688 lorries idling all day. The alternative for which EGRA has consistently argued is to connect berthed ship to a shore-side power supply. This would provide a clean and green cruise port in London fit for the 21st century. Refusal of leave to appeal exhausts any path in the British courts to secure a better cruise port for London. EGRA will continue to make the case for using shore-side power and hopes to meet with the London Mayor’s office on 10 March to explore any ways forward. The possibility of a petition to the European Parliament is also being explored, especially after the recent warning of the UK over air pollution. There is now overwhelming evidence that much bad air is the result of burning diesel. Allowing an additional major source of diesel pollution in a densely populated residential area, where pollution levels already exceed permitted levels, is perverse. Doubly so since ship’s diesel is even dirtier than that used in lorries. I and EGRA thank wholeheartedly all those who backed our crowdfunding of the legal campaign. We hope the case has made developers and planners see sense by raising what we consider to be a critical concern of air quality in the UK. Importantly, the decision by the Court of Appeal does not mean that the pollution from cruise liners is going to go away. It simply means that as far as the Courts are concerned Greenwich Council acted lawfully in granting permission to a polluting activity. This does not bode well for planning decisions in future. We do not consider it too late to fully explore the feasibility of shore-side power supply for ships berthed during the most polluted six months of our summer below the windows of many new blocks of flats. We owe it to you all to continue to argue the case for a clean cruise port for London – to those who will listen to what we consider to be sense. At a time when diesel fumes have been identified as a major lethal health hazard it is ridiculous to allow an unmitigated development that relies on burning so much diesel. We will try to continue to update you even though the case in the British courts is over. And please spread the news among all your friends. No wonder, Balmain residents have to suffer an even higher level of sulphur dioxide emissions than we do because standards imposed on cruise ships are lower. This of course shows that the cruise industry will only act when it&apos;s forced to - another reason to fight for shore power! Full details and lots more posts on: Stop Cruise Ship Pollution on Facebook - well worth looking at. The hearing for our application to seek permission to appeal at the High Court is on Wednesday 22nd of February 2017. Please note that we won&apos;t know the courtroom or the time until the afternoon before (most hearings start at 10am). Last week it was announced that Westminster Council are going to charge owners of diesel cars extra money to park their vehicles in it&apos;s parking bays. This is in line with the GLA&apos;s decision to charge all diesel car owners - other those whose vehicles meet Euro 6 emmisions standard - a daily charge to drive withinthe North and South Circular Roads from 2020, or even 2019. We find it strange that cruise ships burning 700+ litres of marine diesel per hour virtually non stop during the summer months have no penalty imposed for not using shore based power. Another reason to try and stop this scheme as it stands through the High Court. Yesterday we heard, as expected, that the initial request to seek leave to appeal has been turned down which means that we will now proceed to an oral hearing (similar to the judicial review). The significance of the date of this was announced won&apos;t be lost on many following the campaign as it was the day that the first &apos;Black Air Alert&apos; was announced in London. This indicates that the air pollution was &apos;very high&apos; beating even the Red Air Alert &apos;high&apos; issued last week. It is this kind of news that makes us more determined than ever to continue the fight for clean air in our locality. Members of Parliament Jim Fitzpatrick and Matt Pennycook called for serious talks to secure a clean cruise port in Parliament on Wednesday 7 September. Speaking for the Government, Gavin Barwell conceded that air pollution is a priority issue in London and promised a high-level meeting. A televised download may be seen of the Westminster Hall Debate. A written Hansard entry is available. We must all hope that this intervention will resolve the impasse and lead to a 21st century solution for London’s first planned cruise port. Permission has been sought to appeal against the High Court decision of 8 August which found for the Council. The request, to the Court of Appeal, will first be made “on the papers”, that is a written application. If refused, we understand that an oral permission hearing will be sought. Only 4 days left to support a case which is now backed by a powerful all-party parliamentary committee. The Parliamentary Select Committee on Environment, Food and Rural Affairs issued a report on 27 April which fully backs our case. Read all about it in the Evening Standard. Now the only serious opposition to installing clean onshore power supply is by the defendant and its interested parties. They continue to press for an outdated and dirty project against all the main mayoral candidates, 2 local MPs and now Parliament. Help us join the future and please donate now. The Greenwich Society, with 500 families in its membership, has made a very generous pledge to support the case. It fully backs the legal challenge to a dubious decision. Thanks to other local groups who are supporting the full judicial review. We now have nearly reached our stretch total for the court hearing. This should be heard in the latter half of June and has been designated a "significant case". The High Court, on 19 April, granted permission for a full judicial review. 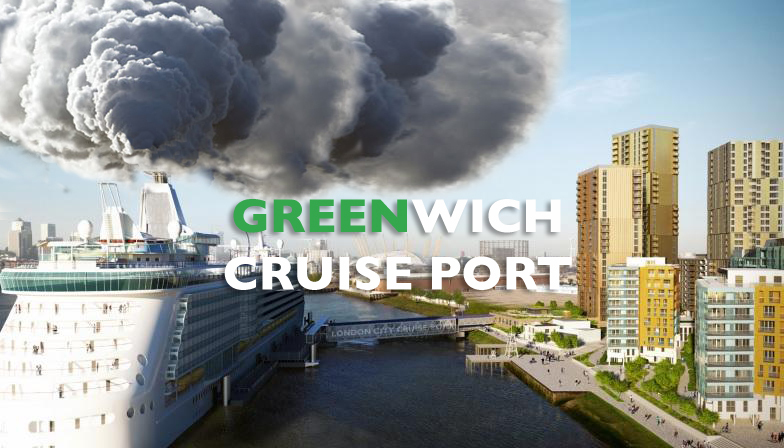 This great decision means that the planning authority, the Royal Borough of Greenwich, arguably made legal errors in their air quality assessment for the cruise liner terminal. First, Caroline Pidgeon (Liberal Democrat) and Sian Berry (Green Party), and last week Zac Goldsmith (Conservative) and Sadiq Khan (Labour) have all backed our solution to the dirty cruise liner terminal. This non-partisan consensus reflects growing public concern about air pollution. All that is needed is the political will to bring the major stakeholders together and thoroughly assess on-shore power supply. Join us in challenging a decision that further pollutes our air. The High Court will hear the application for judicial review on 19 April. This public hearing will determine whether the case will be fully heard in the High Court. We have therefore extended the initial deadline by 31 days to give more people the chance to register concerns for the environment by making a contribution to the cause no matter how small. You have all helped us achieve our initial target of £6,000 within a week. Thank you and spread the word. We will keep you updated on the main milestones of the legal case by email. But keep an eye on this page as well. We already have many supporters; more will demonstrate as much as their donations how seriously we view air pollution. Please remember that further pledges are automatic donations to the cause - but we think it is a worthy one for all our cities as well as Greenwich, and so do many of you.